Are you, or somebody at your company, spending time on your networks every week? If NO, then who’s monitoring your security? If YES, then how much time is lost when that person sets his or her regular job aside to figure out your network upkeep and cyber security? If maintaining your IT network isn’t a full-time job, why not outsource this effort to a company with the correct tools and expertise for the job? Managed IT services are the daily, weekly, and monthly tasks and planning that must be done to keep a computer network operating efficiently and securely. 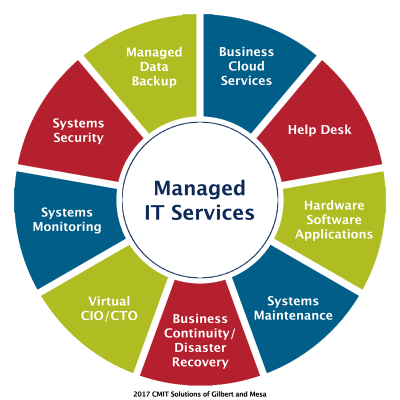 Managed IT services are proactive. As providers of managed IT services, we don’t just react to problems as they come. We prevent the problems from happening in the first place. Outsourcing your network maintenance, data backup, and cyber security is a strategic method for improving operations and cutting expenses. Our motto is: The business needs should drive the technology decisions! Call us for a no-charge consultation. We will assess your IT infrastructure in the context of your business operations and goals, and suggest solutions that fit you now, and can evolve as your business grows. When does a company need Outsourced IT? Sign up for News & Advice! Get info about keeping your data safe!